At a party months ago, my father heard from someone that the 120 was a bus worth riding. 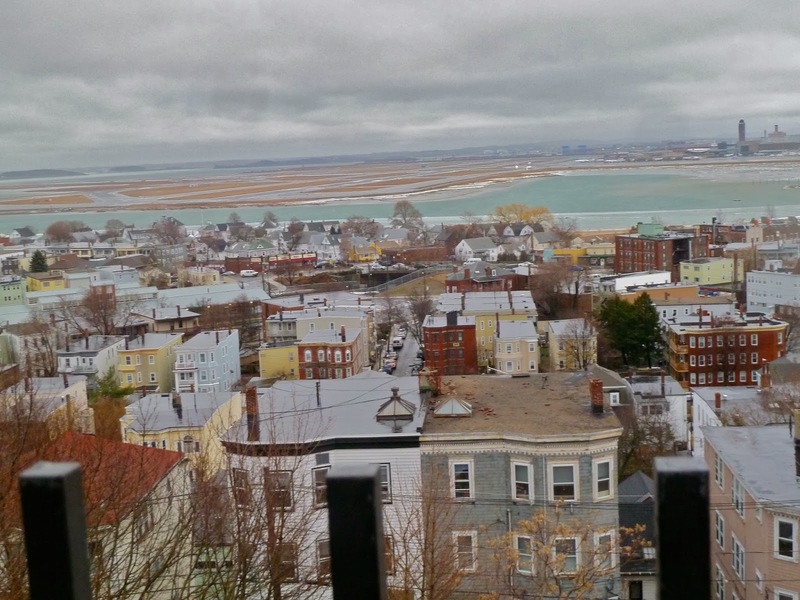 He found out that it goes onto a big hill past a giant statue of Mother Mary that offers fantastic views of Boston. Fast forward to a few days ago, when we were finally able to take the route. I can say now that the views are indeed amazing, and that this bus is definitely worth riding. The route is basically a main trunk portion, and then two loops on either end. On the Maverick side, there's a loop around Jeffries Point, an interesting little neighborhood surrounded by the airport. On the other end at Orient Heights, there's the Waldemar Loop, going around a hilly neighborhood where the statue is located. The loops were originally completely separate bus routes, but they were merged into the 120 in 1969. We decided to start out at Maverick (which, I found out, actually does has two entrances! I'll post about it at some point) and go around the Jeffries Point loop. We waited there for a while having just missed a bus, but one soon came. The driver, however, completely bypassed the station! We went up to the door and knocked. The driver let us in ("Sorry, I'm so out of it today! "), and we were off with a total of six people in the bus. A bad picture of the bus at Maverick. We headed down Sumner Street, going through a quintessential small neighborhood, with small businesses on the first floors and apartments on the upper floors. Once the bus reaches the end of Summer Street and turns onto Jeffries Street, you get a view of the airport which is literally a few yards away. After that, a massive concrete wall sits between the street and the airport beyond. We had been going up Maverick Street for a bit, my father and I being the only ones on the bus at this point, and soon the driver stopped the bus. "Where are you guys going?" she asked us. 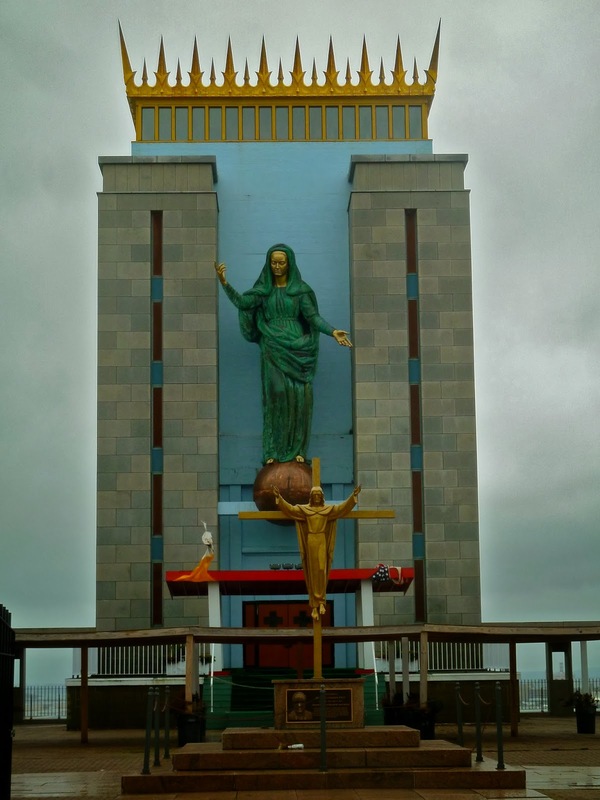 "We're going to see the Mother Mary statue," replied my father. "See?" the bus driver replied. "This is why I didn't pick you guys up!" (I thought you were "out of it.") She went on to say that we should've gotten a bus going to Orient Heights and that we would have to pay another fare to keep going. She said she'd let us go "this time," but apparently one would normally need to pay again. Which makes no sense to me, seeing as it's still the same bus route, isn't it? We went back to Maverick Station and picked a fair amount of people up, then headed up Meridian Street along with all of the other Maverick buses. This one is different, though, because it makes a small loop around a park, stopping at a shopping plaza. We then made our way down to Bennington Street and another nice small neighborhood. At Day Square, where the 112 and, in the morning, the stupid, stupid 121 join up with the 120, there's a neat little wooden shelter that I actually took a picture of. Yeah, the window was a bit dirty. We pulled into the Wood Island busway and picked some people up before heading back up to Bennington Street. We went by some more standard apartments and houses, Bennington Street having gotten wider with nice plants in the median. As we passed a pedestrian bridge over the Blue Line tracks to Constitution Beach (where planes fly really low over, apparently), the Mother Mary statue became visible way up on a hill. Soon after, we came into the Orient Heights busway (the new Orient Heights - review coming at some point, maybe) and dropped most of the riders off with a few coming on. After Orient Heights, we went up Boardman Street, going past a big baseball field. Then we turned onto McClellan Highway, intersecting with some express buses from Boston. It was a fairly industrial neighborhood, but we soon turned again onto Waldemar Ave, going by some fairly run-down projects. There were just trees on the other side, but by looking on Google Maps it turns out there's an industrial wasteland beyond there. We turned onto Crestway Road, and then made a sharp corner onto Faywood Avenue. Faywood Avenue soon loops around and becomes Orient Ave, with a nice if fairly short view of the surrounding area. 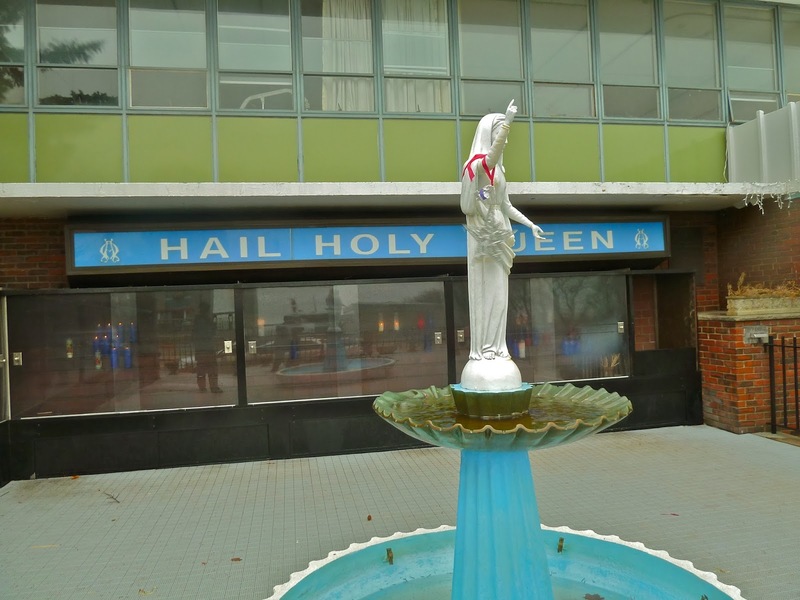 My father and I soon got off at the Don Orion Home stop, as the Mother Mary is right across the street. The statue is absolutely gigantic, and the view is phenomenal. The day we went, however, was very windy, and we had to duck around walls to be able to take pictures without anything blowing away. The statue, in all her glory. See that swampy-looking area in the distance? That's Logan Airport. The planes are really loud when they take off, even from here. 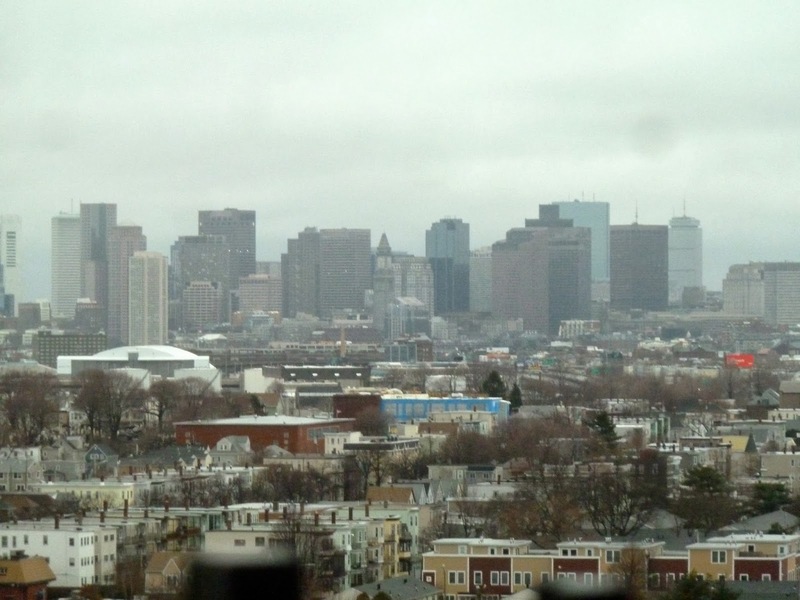 Fantastic view of Boston! It's not that great of a picture, but again, the wind was blowing very hard. The bus coming down the hill. Yeah, I know I did too many pictures bunched up together. We hung around for about a half hour, and soon the bus came. It wasn't very crowded at all, and we made the final run down the hill, back onto Bennington Street, and into the Orient Heights busway. 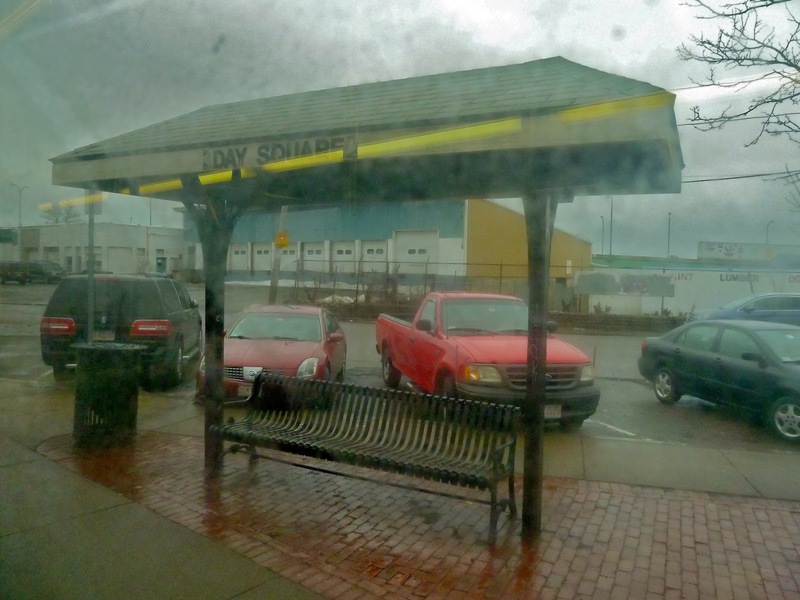 After that, we crossed over to the other busway in the station and headed off to Winthrop, but that's for another post. 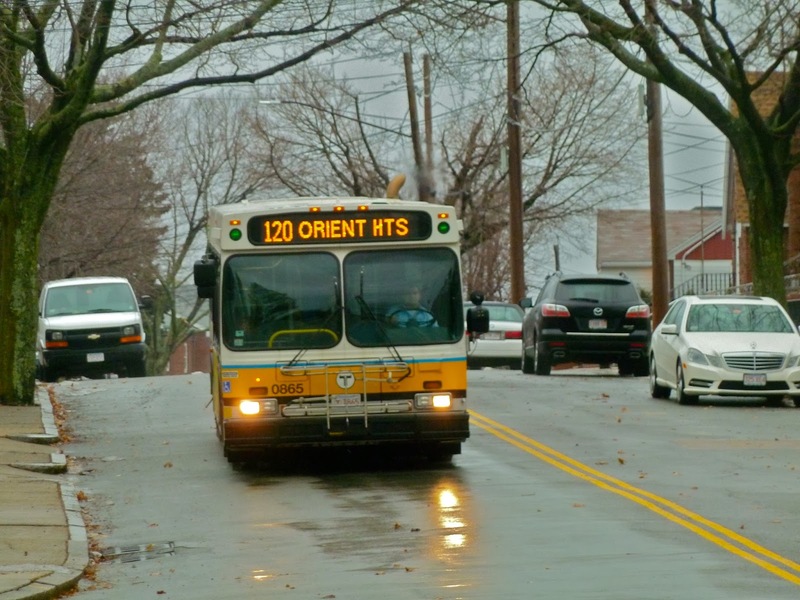 A final picture of the bus at Orient Heights. Ridership: A pretty good amount of people rode - about 30 in total on a Saturday. Of course, about 5 or 6 kids rode, and they don't pay fares, but I counted them anyway. This was a pretty local-heavy bus, with a few people doing shopping at that mall off of Meridian Street. Pros: A nice supplement to the Blue Line (it parallels the tracks almost the whole time). The schedule's nice as well - the bus runs every 20 minutes weekdays and every half hour Saturdays. Cons: It seems like with quite a few buses, the Sunday schedule is a deal breaker. This one is no exception, running every 50 minutes on Sundays. Also, this may not be the bus's fault, but I didn't like how that driver said we would have to pay another fare from Jeffries Point. What if someone lives there and has to go past Maverick? Do they have to pay again, too? Again, a nice supplement to the Blue Line that picks up a lot of local traffic. The schedule's good, except on Sundays when it's pretty darn terrible. 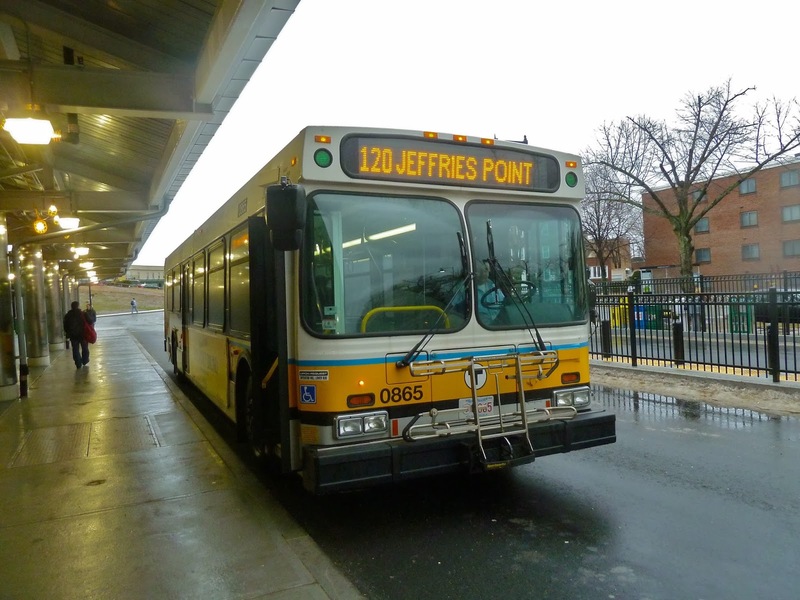 What irked me most about this bus was just the driver at Jeffries Point. Do you actually have to pay another fare there? If anyone knows, leave a comment below. Overall, though, a pretty good bus - I recommend taking it just for the Mother Mary statue. The MBTA is trying to figure out who tagged the historic streetcars in Boylston Station. Why anyone would do such an awful thing is beyond me. On the brighter side, MassDOT released a plan for improving the state's transportation infrastructure. This includes a new Indigo Line as a supplement to the Commuter Rail. Finally, French company Keolis is the new operator of the Commuter Rail system. 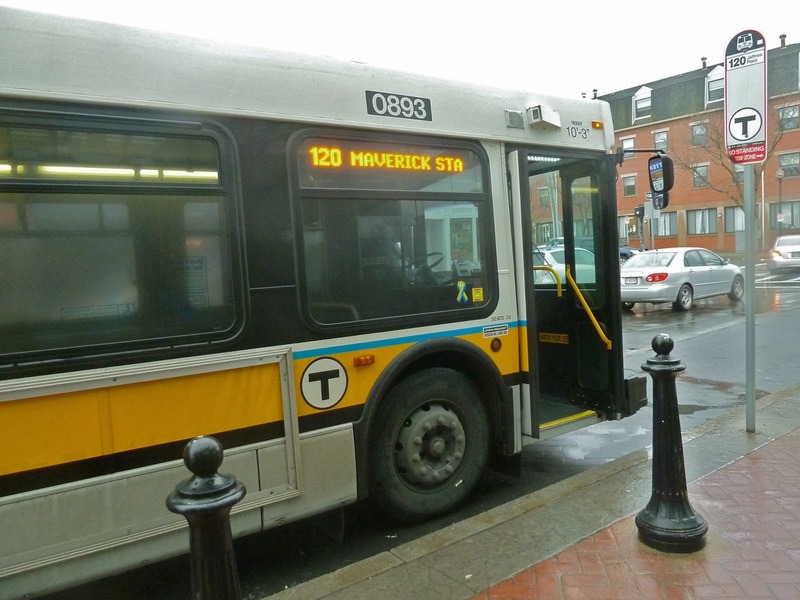 They make you pay another fare because the route runs starting at Orient Heights, stopping once at Maverick, Jefferies loop and then terminates at Maverick, where a new run starts and technically requires a new fare. It's the same as if you were in a 112 and it became a 110 at Wellington, except the route stays the same. Silly, I know. Ah, okay. Do you know if it also applies for the Waldemar Loop, or is it just at Jeffries Point? It does, the same thing would apply. The end of the route is not the first stop at Orient Heights, but the second, same as Maverick. I was an operator out of the Lynn garage when I first started at the T and always found the rules to be incredibly convoluted. Ahh...I knew you had taken mugshots of me!! !